If Souls Become Non-Existent in the Lake of Fire Then How Do You Explain Christ’s Words in Mark 9:44-48? Please explain the following verses, if unrepentant sinners are to die a second death in the lake of fire and will exist no more?? Thanks for your question. Those are strictly metaphorical statements being made by Jesus Christ in Mark 9:44-48. For example, the phrase “Where their worm dieth not, and the fire is not quenched” is in reference to the big garbage dump which burned perpetually outside of Jerusalem during the time of Christ (in the valley of Hinnon, outside of Kedron). In other words, the city of Jerusalem of Christ’s day was a relatively large, cosmopolitan city. Historians estimate there were 80,000 to 100,000 citizens in Jerusalem during Christ’s time, and that the number could swell to a million or more people during the various religious feast periods like the Passover, Pentecost (i.e., Feast of Weeks) and the Feasts of Trumpets and Tabernacles. Trash was thrown into that big garbage dump every single day by the 80,000+ residents of Jerusalem. And every day the new trash added to the dump was set on fire to help make room for more trash the next day. So the entire dump was constantly smoldering with a low-level fire that eventually burned everything up. In essence, the garbage dump outside of Jerusalem burned perpetually. It was an ongoing, never-ending process because the entire city used that dump to get rid of their trash every day. 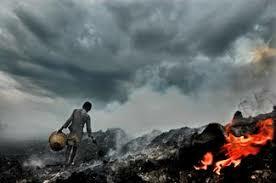 And every day they set on fire the new trash that was thrown into the dump. What’s more, dead animals — dogs, cats, cows, horses, sheep, you-name-it — were thrown into that same garbage dump on a daily basis. So there were constantly worms crawling in and out of the dead moist flesh, until the dead bodies worked their way down the steep sides of dump and into flames hot enough to completely destroy the meat, skin and fur. Keep in mind they didn’t have a local animal shelter where you could take your dead pet, or your dead cow, sheep, horse or goat, and have it cremated and its ashes put in an urn, like they do today. They only had that big garbage dump outside of the city. And that’s where everything ended up when it was no longer usable. “Well before the time of Jesus, the valley was also used as a refuse heap. The people in the surrounding areas dumped their trash in Gehenna, where it burned day and night. The fire never went out. It smoldered there beneath the surface, incinerating the rotting, smelly garbage. “New garbage was piled on top of the old decaying garbage: rotting fish, slimy vegetation, decaying human refuse of every imaginable sort. And as you know from experience, a dump without flies is a dump without garbage. The flies laid eggs on the surface of the dump. So just imagine the hundreds of thousands of squirmy, wormy maggots living there, eating the rotting refuse. All the while, under the surface, the fire still burned, devouring the putrid garbage days and weeks past. “It was a fire that burned forever, where the worm did not die and where people went to throw their trash, grimacing from the stench, gritting their teeth in revulsion, never venturing too close for fear of falling into the abhorrent abyss. “In times of war, decaying human flesh mingled with the rotting garbage—imagine the vile vision. “Due to recent excavations since Bailey’s widely cited 1986 article, we now know that there was a garbage dump on the south-eastern slope of the City of David. Excavations have revealed bones of sheep, goats, donkeys and fish, ordinary household garbage, pottery shards, coins dated during the time of Pilate (26-36 AD), and urban rubbish collected from the city and dumped over the city limits where it reached a depth of 10 meters. So Christ likened this 10 meter deep (i.e., 32 feet deep) garbage dump, by metaphor, to hell, which is to say, to the lake of fire of Revelation 20:13-15 into which “the dead” (meaning the spiritually dead, i.e., the souls of non-repentant people) will be cast at the time of the great white throne judgment. And Christ likened those dead animal bodies in that dump, that were full of worms, to the spiritually dead people who love to hang on to their sins instead of getting rid of them so they can go to heaven. So Christ’s teaching was a simple “picture language” metaphor that He knew the people of Jerusalem could easily understand because they could see that garbage dump smoldering with fire all day and all night long just outside of the city. But the trash in that dump didn’t stay there “forever and ever.” Like any trash that’s set on fire, it got burned up completely over time. Turned to ashes. Destroyed by the flames. And that’s what the great lake of fire (Revelation 20) is going to be like for those who prefer to retain their sinfulness and unfaithfulness now, in the flesh, rather than get their minds right with the Lord and repent. They will simply never exist again. Likewise, Christ’s statement that “And if thine eye offend thee, pluck it out: it is better for thee to enter into the kingdom of God with one eye, than having two eyes to be cast into hell fire” was also a metaphor. It simply means clean up your act NOW and get rid of the things in life that are weighing you down or pulling you away from the Lord and His Word, because it’s better to enter heaven with NOTHING than to try to hold onto the fleshly things of this life that are anathema to the Lord and His family household. In other words, let’s say a person’s sin was inordinate love of money to the exclusion of everything else, as in Christ’s parable of the rich man and the beggar Lazarus. That very rich man would have been better off getting rid of all of his money right then and there, while he was still living in the flesh, rather than risking losing his opportunity for eternal life in God’s eternal household. But he loved the money more than he loved the Lord. A drug dealer, to use another example, would be better off losing his lavish lifestyle, fancy cars, etc., and being reduced to poverty if necessary, rather than continuing on in his drug-dealing sinfulness and risk losing his eternal soul in the process. So you can’t take those passages in Mark 9:44-48 literally. Christ’s statement that “And if thy foot offend thee, cut it off: it is better for thee to enter halt into life, than having two feet to be cast into hell, into the fire that never shall be quenched” didn’t mean there are a bunch of people running around in heaven with no feet because that’s the only way they could get in. Everybody in heaven is in perfect spiritual bodies. Again, Christ was speaking a metaphor, saying we need to get rid of the things in our lives (like fleshly sinful behavior) that hold us back from living for the Lord, and loving Him with all of our hearts. Otherwise, we might not make it into His eternal kingdom. So the sins of unrighteousness — such as fornication, idolatry, adultery, men playing the role of women (i.e., effeminate = transgenderism), as well as the sin of homosexuality — are specifically spelled out in verse 9 above as sins that will automatically get you shut out of heaven if you don’t get rid of them while you still have time on this earth. And in verse 10 we see thievery, covetousness, drunkenness, abusiveness (i.e., “revilers”) and extortion are also sins we have to get rid of if we want to enter into the eternity with the Lord. “Fearful” in the above verse should have been translated “faithless.” The faithless, the unbelieving, the abominable (i.e., practitioners of sins the Bible refers to as abominations), murderers, whoremongers, sorcerers (i.e., drug dealers), idolaters and “all liars” are all going into the lake of fire, where the soul is completely destroyed. And yes, that “lake which burneth with fire and brimstone” in the verse above is exactly what Christ was referring to when He spoke metaphorically of that garbage pit outside of Jerusalem. But the point is this: The specific sins spelled out in that verse preclude a person from getting into heaven. So if a person is that kind of a sinner, they’d have to get rid of those sins now, in the flesh, or risk being left out when the eternal role call is read at the time of the judgment. By the way, the “second death” mentioned in Revelation 21:8 above is the death of the soul. The first death is the death of the flesh. Those are the only two deaths there are. So if a person were to practice any of those sins listed in that verse while in the flesh, and if that person didn’t repent of them and get them out of his or her life before this flesh life is over, then there’s a very real risk that God is going to cast that person into the lake of fire, “which is the second death,” and that person will never exist again. In other words, that’s where your soul gets burned up, never to exist again — just like the garbage and dead carcasses in the garbage dump outside of Jerusalem that were burnt to ashes every day never to exist again. In the past, I’ve read news stories about people who took those words of Jesus in Mark 9:44-48 quite literally. For example, one news story was about a guy who actually plucked out his eyes because he couldn’t quit looking at women sexually. Yet doing something like that is based on a distinct failure to understand the simple and very powerful metaphor behind Christ’s teaching. His teaching in Mark 9:44-48 basically means that it’s better to endure the removal of stumbling blocks or sins now, while we’re still in the flesh, than to risk being cast into hell later and losing eternal life. It had nothing to do with cutting off body parts. That was just part of the metaphor representing the sins of the flesh. What needs to be cut off from our lives is sinfulness and lack of faith. So the guy I mentioned earlier who plucked out his eyes is now blind as a bat. But he still has his sinful nature, because he never really dealt with the sinfulness. Instead, he tried to take a short cut by plucking out his eyes, which weren’t his problem in the first place. That’s what happens when we don’t understand the difference between a spiritual metaphor and a statement of physicality. The bottom line is that Jesus Christ used the garbage dump at the valley of Hinnon just outside of Jerusalem as a metaphor for how we’re going to end up if we don’t do things God’s way. The flames in that garbage dump burned perpetually. But anything thrown into those flames was burned up and turned to ash, never to exist again.